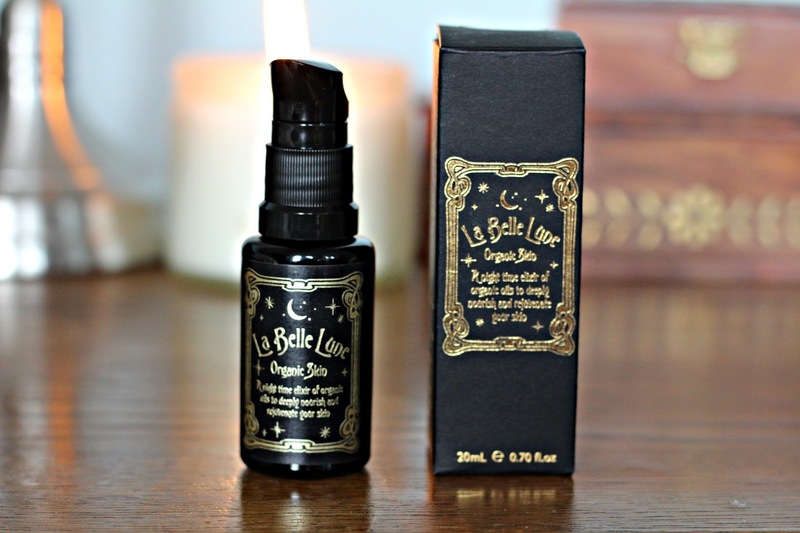 An oil to heal your skin while you sleep, that’s La Belle Lune. Putting aside for the moment the benefits of using a face oil, I just adore the ritual of getting ready for bed and this oil slots in very nicely in an evening routine. My bottle is actually all finished as I bring you this review, it has been on my to do list for some time now, so let’s get on and talk about the product. The first thing that caught my eye are the gothic graphics and font, for those who want their products to look good as well as work, La Belle Lune very much fit’s that category. The oil is housed in a miron glass bottle to keep the contents fresher for longer but I doubt that finishing it up before it expires will be a problem for most people, especially as the bottle is a twenty ml size. The next thing that caught my attention is the scent, it has a wonderful essential oil blend that is calming and relaxing but not too heavy. Lavender is definitely the predominant scent, but it also has Rose and frankincense which really add depth. The oil has a medium texture, not too thick but rich enough that it feels quenching on thirsty skin. I like to apply a simple rosewater before applying. I use two pumps every evening, as my skin is on the drier side I occasionally use three especially when doing a facial massage as this oil works perfectly with a jade roller. There are lot’s of oils on the market and I have done my fair share of testing. Where I think La Belle Lune does well is that it fits the luxury category both in looks and performance but without the hefty luxury price tag of other oils. The ingredients are entirely organic and you have some really interesting additions that are a little bit different from the norm. You have rosehip oil, milk thistle oil, chia seed oil and avocado oil, it feels like the ingredients in the blend all work very well together to soften and nourish. The first thing I noticed is that the oil has a nice plumping effect upon use, the second thing I noticed was that it has a nice calming and soothing effect on the skin taking own redness and minor irritations. It doesn’t feel quite as active as other oils such as Vintner’s Daughter or Uma, but I actually found that to be a plus because I felt happy using La Belle Lune even when skin was feeling slightly sensitive. A lovely little bottle of goodness for the skin, I think La Belle Lune is a great all round face oil that I think a lot of people will love. Organic skin is priced at £46 for 20 ml and you can purchase from www.labellelune.com or Content Beauty. A brand I have loved discovering and would love to see more products from in the future.